Hartpury continued their imperious start in National League 1 with this eight-try demolition of a brave but out-classed home team. Blaydon have not had the best of starts to their campaign, but are known in be strong in the pack and traditionally very hard to beat in their own back-yard. However, they could not live with their visitors in a match which Hartpury dominated, playing at a fast and furious pace whist showing more control and accuracy than in last week’s outing at home to Ionians. A long journey and a slightly disrupted build-up in which fly half Jacob Perry was withdrawn, through injury, only an hour or so before kick-off, were hardly ideal preparation for a fixture that is always a physical challenge. Jamie Forrester, who can play virtually anywhere across the back line, was the man to step into the 10 shirt. Mike Wilcox made a welcome return at full-back while Elias Caven got another chance to show his pace on the right wing. The forwards had a familiar look, with Will Safe returning to the back row after missing the last game. The weather was kind to the visitors, as a grey and wet morning turned into a calm, dry and sunny afternoon as the kick-off approached, the playing surface well-grassed and firm. Blaydon might have wished it was otherwise as Hartpury, running strongly and handling well, were quickly into top gear. The scoring started early when a sustained Hartpury attack, probably ten or twelves phases stretching Blaydon from one touchline to the other, brought a penalty kicked by Forrester from in front of the posts. From the re-start they were immediately in again, this time with a five-pointer. Elias Caven found himself in space after an interception and showed his speed by out-stripping the cover defence, recording his first try for the club with a 60-metre run. Blaydon were barely getting a hand on the ball as the visitors dominated the breakdown and half-backs Harry Randall and Forrester were quick to get the three quarters involved at every opportunity. 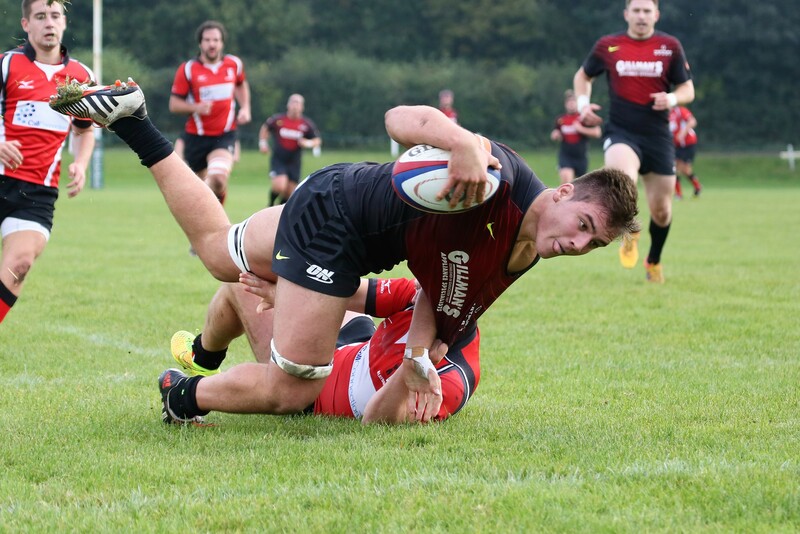 Jake Polledri is one of the first names on the Hartpury team-sheet and the explosive flanker rocked Blaydon with two tries in quick succession late in the first quarter. The first was a typical bull-dozing run, finishing another high tempo attack by carrying tacklers with him over the line. Two minutes later, he again broke a tackle in midfield before finishing from forty metres close to the posts. If there was any criticism of Hartpury, it was that they failed to convert all but two of their tries, missing even some relatively simple kicks in the process. Forrester, Wilcox, Caven and replacement Robbie Shaw all took a turn, with only the latter two having any success. Although this was not a game in which it mattered, 12 points spurned might be significant on another day. Completely in control, Hartpury had the bonus point wrapped up by the 35th minute. Blaydon were penalised near half-way and Randall’s tap-and-go caught home defence on its heels. It looked as though he would score, but was dragged down agonisingly short. He did have the presence of mind to pop the ball to the supporting Caven, for the Bristol flyer to double his tally. Blaydon did have some better periods after the break, but not before Hartpury had extended their lead to 28 points early in the second half. A Jamie Forrester break from deep in his own territory created the field position and Hartpury were not about to waste it, Steve Leonard eventually finding the gap in an over-stretched defence. Flanker Jason Smithson did finally get Blaydon on the board, reward for some powerful driving play, but normal service was resumed as Hartpury finished strongly. More sustained pressure produced two further tries for Polledri with typically powerful finishes and there was just time for big winger Jonas Mikalcius to get in on the act. Having been closely watched by the Blaydon defence all afternoon, he finally produced a lovely finish by collecting his own chip ahead, on the full, before sprinting behind the posts. Hartpury now face a home fixture with Ampthill, who will be keen to underline their own promotion credentials when they visit the College next Saturday. However, the Bedfordshire club will be needing to shake off the after-effects of a home defeat to another leading challenger, Blackheath, at the weekend (17-31). Birmingham Moseley remain very much in contention after their win at Rosslyn Park (24-31) and Plymouth Albion also keep in touch with a big home win over long-distance travelers DMP (39-3). Coventry, with an infusion of talent from near neighbours Wasps, enjoyed themselves at home to Fylde (53-24) while Loughborough Students continued their bright start to the season by winning at Old Albanian (26-35). Cambridge just won the battle of two promoted sides when Macclesfield visited (26-20), although the closest result of the day was Ionians narrow home win over Esher (32-29). Saturday’s game versus Ampthill kicks off at 2.30pm. Blaydon: Connon, Bratton, Wilson, Bramwell, Cooney, Foreman, Horsfall; Kalbraier, Thompson, Davison, Wearmouth, Archibald, Smithson (Try 55) , Davidson, Jones. Replacements: Backwith, Morris, Davis, Dawson, Lawson. Hartpury: Wilcox, Caven (Tries 4, 35), Leonard (Try 42), Eves, Mikalcius (Try 79), Forrester (Pen 3), Randall; Flook, Taylor, Thompson, Oakley, Dancer, Polledri (Tries 13, 15, 70, 77) Gilbert, Safe. Replacements: Stephenson, Merrey, Brockett, Chan, Shaw.